"Makes a perfectly smooth coating for cakes. Roll it out to 1/4 inch thickness for best results. Glucose and glycerin can be found at most cake decorating supply stores. You may color it with three drops of whatever food coloring you desire." Place 4 cups confectioners' sugar in a large bowl. Make a well in the center and using a wooden spoon, stir in the lukewarm gelatin mixture. Mix in sugar and add more a little at a time, until stickiness disappears. Knead in remaining sugar. Knead until the fondant is smooth, pliable and does not stick to your hands. 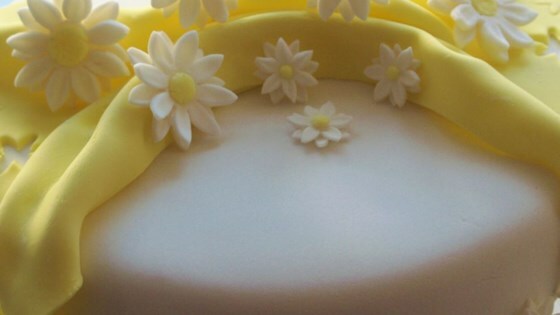 If fondant is too soft, add more sugar; if too stiff, add water (a drop at a time). Use fondant immediately or store in airtight container in fridge. When ready to use, bring to room temperature and knead again until soft.